One woman living with disabilities told this writer on conditions of anonymity that she receives $769 per month in benefits. Nonetheless, in a desperate attempt to stave off homelessness, she signed an agreement with the Treasurer’s office to pay $500 a month until her delinquent property taxes are paid off. On Thurs. March 19, members of the Moratorium NOW! Coalition, Detroit Eviction Defense and others took the issue to the Wayne County Commissioners meeting demanding an immediate halt to the foreclosures. Over a dozen people testified before the elected legislative body placing a human face on the crisis. Many households have had delinquent water bills placed on their property taxes. Oftentimes the water bills are in excess of the tax payments that are in arrears. The following week on Tues. March 24 a rally and press conference was held outside the Coleman A. Young Municipal Center (CAYMAC) prior to an intervention at the City Council meeting where dozens testified about the crisis also calling for a moratorium. During the public comment section of the meeting people came forward to discuss their plight under these repressive tax laws. Speaking before the City Council were representatives of the Russell Woods Neighborhood Association, Moratorium NOW! Coalition, Detroit Eviction Defense, Michigan Welfare Rights Organization, Detroit People’s Platform, We the People, as well as unaffiliated residents of Detroit seeking some guidance and relief from their elected representatives. Although several City Council members express concern and discussed a resolution they were preparing for the following Mon. March 30, the ultimate decisions lie with the County treasurer and Gov. Rick Snyder. After the Council meeting people marched from City Hall to the Wayne County Treasurer’s Office. The deputy treasurer came out to respond to the demonstration saying they are doing more than anyone else to stop the foreclosures. A demonstration organized by the clergy in honor of the 50th anniversary of the Selma to Montgomery March was leafleted on March 28 calling for people to take political action. Another demonstration was scheduled to take place at the Wayne County treasurer’s office on Tues. March 31, the deadline for the payments on taxes three years behind to be made. After March 31, if delinquent taxes for 2012 are not paid or arrangements made, residents will lose title to their homes. Within six months, the homes could be sold in an auction where unscrupulous so-called “developers” are given priority over the residents who may seek to repurchase the properties lost to foreclosure. The scene at the Wayne County Treasurer’s office was chaotic on March 27 as members of Detroit Eviction Defense, the Detroit Active Retirees and Employees Association (DAREA) and Moratorium NOW! Coalition distributed thousands of leaflets to people crowding into the building in a desperate attempt to avoid foreclosure. The following Sun. March 29, members of Moratorium NOW! Coalition and DAREA walked door-to-door leafleting for the March 31 demonstration in the Boston Edison Historic District, one of the hardest hit residential sections of the city where many of the homes are vacant due to mortgage and tax foreclosures. Plans undertaken by the quasi-governmental agency, the Detroit Land Bank Authority and the Detroit Blight Removal Task Force, headed by billionaire banker and corporate mogul Dan Gilbert, has failed miserably in their program aimed at auctioning or demolishing homes throughout the city. Tens of millions of dollars have already been wasted by the bankers’ initiatives on blight removal, where federal funds which should have been utilized to keep people in their homes are being misappropriated to tear down structures creating more flight and abandonment across key neighborhoods. Moreover, Wayne County is being threatened with emergency management and bankruptcy later this year, similar to what Detroit went through in 2013-14. 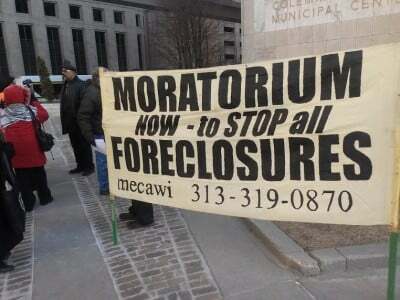 Consequently, the massive foreclosures will not prevent a state takeover of the operations of Wayne County. The so-called “plan of adjustment” is already unraveling with retirees facing foreclosures resulting in pension cuts, rising healthcare costs and the failure of corporate-imposed white mayor, Mike Duggan, the first in forty years, to attract the necessary investment that could create jobs and economic opportunities for the African American majority, some 82 percent of the overall population. Duggan on March 24, the day where hundreds of people rallied and attended the City Council meeting demanding a moratorium on tax foreclosures, attempted a diversionary tactic by announcing a program to provide supposedly “interest-free” loans to city residents up to $25,000 to carry out home repairs. Such a project will not be effective since approximately 37,000 of the 62,000 properties slated for foreclosure are owner-occupied. Nonetheless, by March 29, Duggan was already crying broke saying that the blight removal funds were drying up and that more money was needed from Washington to tear down vacant homes in Detroit. Obviously, the banks, corporations and their surrogates in government have no real plans to revitalize Detroit. Only a coalition of neighborhood and mass organizations rooted in the working class can create the conditions for the overturning of the bank-led Snyder-Duggan program of fiscal austerity, mass impoverishment and forced removals.